Providing a secure environment for customers is more than just protecting data. What can we do to help everybody feel secure with every transaction throughout the entire journey? 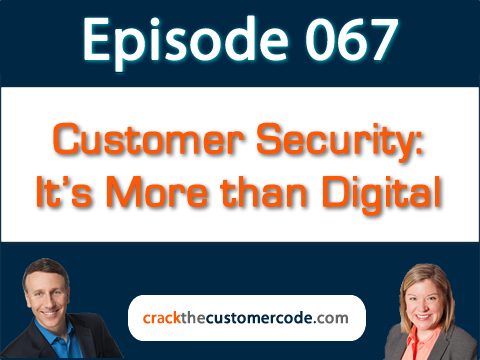 Security is often overlooked as part of the true customer experience, but it’s a critical part to consider. Consider not just handling the minimum level of security to avoid liability. Consider how to help your customers feel reassured they are secure. If humans don’t feel secure, everything else is ignored. It’s impossible to enjoy an experience if you don’t feel safe. Digital experience has its own set of challenges, and reassurance is key. In many restaurants around the world, the restaurant patron never watches his or her credit card walk away with the server. Instead, the server brings the card reader to the table. This is the moment in the journey when providing this reassurance assuages fear of credit card fraud. Find out what Virgin Hotel did to help women business travelers feel secure going to their rooms. Have you ever felt insecure in a parking lot? Jeannie and Adam both share stories. How can you provide more security and communication to your customers and employees around personal security? Listen in to hear more and then share your stories with us!